BRISTOL - As Bristol Eastern baseball manager Mike Giovinazzo trotted out to his familiar spot next to third base before the Lancers’ home game against New Britain on Wednesday, an old friend greeted him from the stands with a playful joke. Giovinazzo shared a laugh before getting back to what he’s done for the past 45 seasons: coaching the Lancers from the foul side of third base as the team’s long-time head coach. While the warmth of spring still hasn’t made its arrival in central Connecticut, Giovinazzo isn’t thinking about the Florida heat or any kind of retirement. He feels right at home in Eastern white and blue, instructing his players to keep their shoulders in and look to drive the ball to the opposite field. Giovinazzo then lifts his fist to his head and gives it a couple knocks for good luck. No, it’s not made of wood, but the baseball nut likely has enough knowledge of the sport in his brain that there is some semblance of a wooden bat in there. 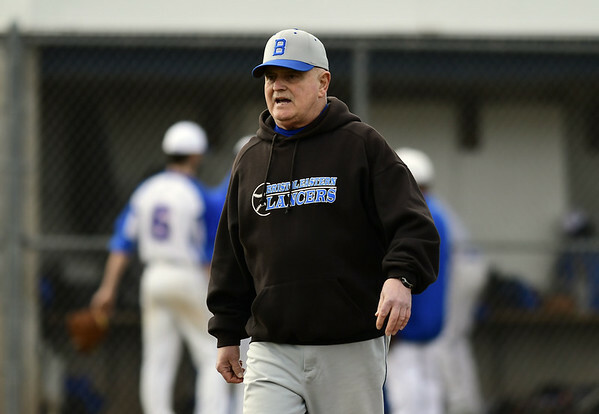 Giovinazzo is as much a staple at Bristol Eastern as home plate is to the sport he loves, and 45 years after taking the job, the enthusiasm hasn’t wavered. While parts of the game have changed along the way, Giovinazzo has stood pat in his coaching etiquette. Still appreciating the old-school, act-like-you’ve-been-there-before mentality, Giovinazzo has little patience for excessive celebrating or showboating from his players, even in the era of bat flips and emotional celebrations from the pitcher’s mound. His views are apparent after an RBI double by Jacobi Bouchard in Wednesday’s win, when an excited Bouchard shouted back to his enthused teammates in the dugout, perhaps showing a little too much than Giovinazzo would have liked to see. “Just play the game!” Giovinazzo shouted from the foul side of third base, as Bouchard quickly obeyed. While the current squad looks up to today’s MLB stars and the outward emotion they express, the Lancers look up to their coach even more. After all, his philosophy has led to plenty of winning for the Eastern program. For Giovinazzo, business has been good for the past 45 seasons. Wednesday’s win put him just five wins away from the 600th of his career, which will almost certainly come this season as the Lancers are off to a 2-0 start and seeking another state tournament berth. His resume speaks for itself, even as he awaits a round number next to his career win total. A state championship in 1986, almost twice as many career wins as losses and countless impacted athletes headline a legacy that is still being written. As long as Giovinazzo is the head coach at Bristol Eastern, players will follow his lead. Giovinazzo plans on winning many more games with the Lancers, even if others wonder when he will kick back on a beach in Florida. For Giovinazzo, the infield dirt is far more comfortable than the Florida sand. Posted in The Bristol Press, Bristol Eastern on Thursday, 11 April 2019 21:17. Updated: Thursday, 11 April 2019 21:20.